Even though, every year I perform at countless corporate events, private parties, weddings and children’s parties I feel it is my job to give back where I can. This year, one of the charities that I chose to support again was ‘Children in Need’. This is a nationwide event but in Nottingham Boots support by opening up there phone lines and taking calls throughout the night. All of the operatives and staff give up their time free of charge to take donations for a very worthwhile cause. This year I roped in one of my fellow magicians to entertain the front line staff between calls. There was a great atmosphere and it was great fun. This year was again another success with Children In Need raising even more money than ever before. 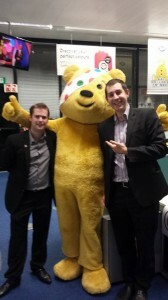 See below a pic of me and my colleague with the big yellow bear himself.